Today’s images of Richard Armitage as Sir Guy of Gisborne were contributed by Laura Serna. Thanks very much, Laura! 🙂 One of her images is below and another is used for today’s calendar page. This image is cropped from a promo picture and I suspect we’re not seeing Guy but instead it’s Richard Armitage himself. Does anyone know which episode this is from? 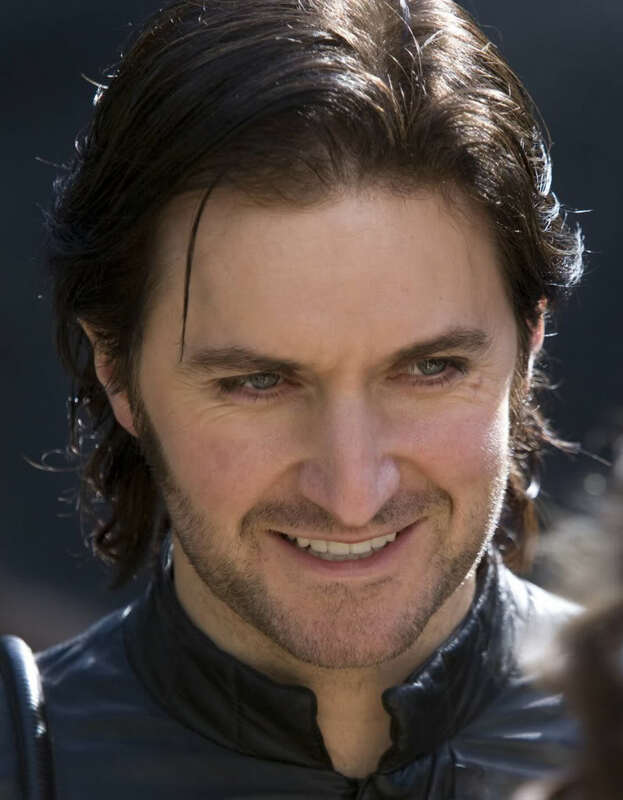 Here is your Sir Guy of Gisborne calendar updated to the 22nd of December. Any guesses on what Peter Jackson’s treat might be? Or when? Then you would type or copy and paste the word cake when prompted for the password. This entry was posted in Calendar, Graphics, richard armitage and tagged calendar, graphics, guy of gisborne, peter jackson, richard armitage, richardarmitagenet, richardarmitagenet.com, richardarmitagenetdotcom, robin hood, the hobbit. Bookmark the permalink. I think you’re absolutely right B. That’s Richard’s smile! so swoonable. @jules: ROTFL re: the stilts and hair and pipe!!! Well I’ve mellowed a bit since the trailer came out a few days ago. My heart rate is nearly normal again. I wonder when Peter Jackson’s treat will appear. It’s almost Christmas! Maybe Christmas Eve hopefully! I did laugh when I read that Richard Armitage was wearing lifts to play a dwarf. That is a great story he can tell on all the American talk shows. He is such a great storyteller I long for the day he appears on our TVs in the states. Thanks so much for your calender Bccmee. @NovemberBride: Haha, thanks! Yes, that Peter Jackson is such a tease! Good luck on getting things done. I’m hoping to get my video finished by tomorrow but it might not be till the 25th. Time will tell, LOL! @Carolyn:OMG, I too put this song on my mobile (next to the audio file from Frozen which some time ago Bccmee put on this blog 😉 ) LOL! @Ania: Haha, I just listened to that sound file from Frozen yesterday. It’s more accurate than ever, LOL! @Carolyn: I can only take the singing in small doses or I will go mad! Good for you for facing the madness, LOL! Richard Armitage’s dazzling smile as Sir Guy here is breathtaking! Oh, what joy and bliss it will be for some lucky lady to inspire those smiles in RA some day. Sighhh! Loved Booby and the Beast, too – just part of that nutty, anachronistic fun of the first two RH series! Collapsing in laughter over a 6’2″ person having to wear shoe lifts. Hmnn, would be an idea for moi? @Luciana: He truly is lovely to look at and I never tire of doing so. 😀 Maybe RA will someday use your name in an audiobook, movie or TV program and that will help you remember your name, LOL! The Booby and the Beast was also a favourite episode of mine! I’ve often re-watched it just to see Guy’s expressions in the background! Priceless!!!! I think the picture above must have been taken during a break from filming though, as I don’t think Guy ever smiled as broadly or as genuinely as that in the series. At least we know it was Lucy he was smiling at!! 🙂 I agree with Gratiana and hope that the “right one” will come along for him soon, bless him! Like you, November Bride, I’m finding it almost impossible to tear myself away from this ‘puter to do chores!! My bed isn’t even made which for me is pretty shocking as I can’t stand an unmade bed! I keep hearing that beautiful voice singing the “Misty Mountains” song. I think Howard Shore’s score for the movie is going to be nothing short of spectacular! The fact he is Canadian makes me even more proud. I sure hope they release a CD of the soundtrack at some point although we might have to wait a bit for that! As usual, thank you so much, Bee. for the tremendous work you do for us on a daily basis and and extra big thanks of course for the Hobbit trailer and the transcripts! You are one in a million!! Oh, and BTW, for those in Canada, we have a treat today and tomorrow at 5pm PST as Vision Network is airing The Vicar of Dibley’s Christmas special from 2006 starring the dreamy Harry Kennedy!! My PVR is already set up as my DVD’s are out on loan to my Granddaughter!! @Teuchter: I don’t know if I’ve seen the entire episode, but I have enjoyed watching Guy in the background glowering at the flirtations between Marian and the Count. I do remember that Howard Shore is Canadian. What a fantastic talent. That song would give me chills no matter who was singing, as long as it was sung well. The fact that it is Richard Armitage makes me unspeakably happy. I always wanted to hear him sing for “real,” not as he did in Clarissa and the Robin Hood audiobook. Oh, my!!! Thanks to you, darling B for such treats!! I don’t know where I found this one but I’m completely sure is from The Booby and the beast. I know all this casino thing makes no sense at the time but it a priceless chapter for me. It makes me laugh. Plus Richard’s gorgeous smile on display. Hmmmm…what’s this about an audio file from “Frozen”? Smiling Guy is … rare and preciously handsome! Today’s pic is to be treasured. Thanks a lot, B. and Laura. Oh, I love his smile! It’s so soothing. Bccmee, you’re right I see Richard’s smile LOL! Thanks, BCC and Laura! Gorgeous pics as usual! Where does the one on today’s calendar come from? This calendar is getting to be a bit too much for me! 😉 So many swoon worthy pictures!!! Today’s pics in particular are spectacular…that smile just makes me melt. I have know idea what PJ’s surprise could be, but I’m anticipating it along with everyone else!!! @chabesquen: I’m very excited at the prospect of Peter Jackson’s surprise! Hope my heart can take it, LOL! I surf daily for screencaps of SirG and still find some breathtaking surprises like this one. Where did you find it? Oh dear, thank you Laura for this shot! @Carla: I will bring some Thorin plates for throwing and Thornton teacups, LOL! GoG rockin the Guyliner!!! OMG why is he so handsome!! Thanks Bccmee and Laura great pic. Beautiful! This smile can light up the world!